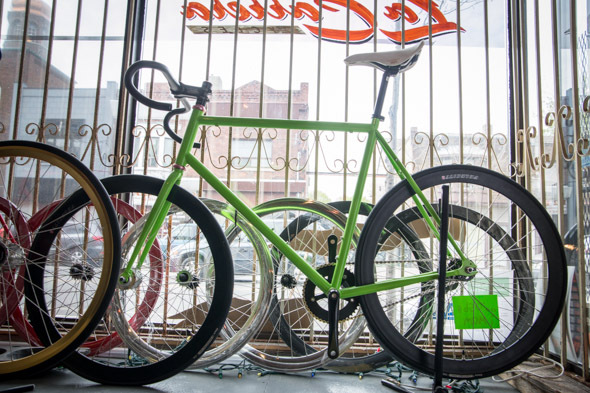 La Carrera Cycles is dressed in a splatter of memorabilia, which is juxtaposed nicely against a wall display of high end frames and apparel leading to a service bay area in the back. 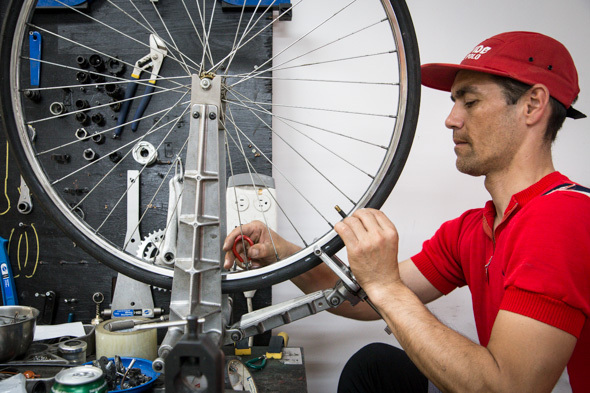 "We've been in the bike service business for 14 years, 20 years for me personally," says Nadir Olivet, former sporting director of Red Bull Race the Place , working unhurriedly on a bike. His colleague, Keith MacDonald (former owner of Cavern Cycles), waves hello from the back, engrossed at Greece getting hammered by Colombia. La Carrera is definitely a place for road and track bike aficionados. 'La carrera' is, after all, Spanish for 'race'. "Red Bull was an awesome experience, and I'm really grateful for it. Now, I see us focusing more on parts and services." There was a Fuji racer on display for $829 right beside a gorgeous black and white customized Giant Propel Advanced racer for $12K. 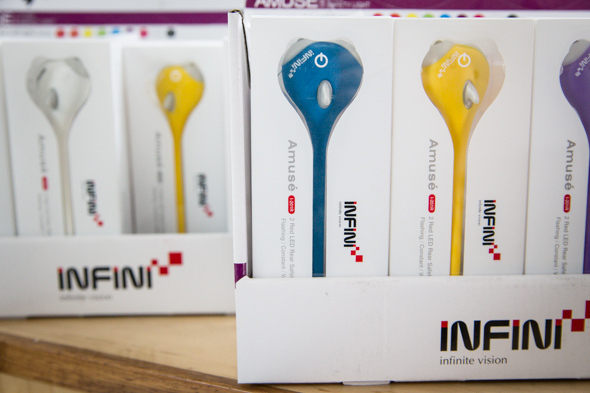 The shop has a longstanding partnership with graffiti artists Stash and Futura, offering customized frame designs (most popular are ones by Colnago ) among other pieces bearing their signature designs. Custom builds can go as high as, well, as high as you have money. 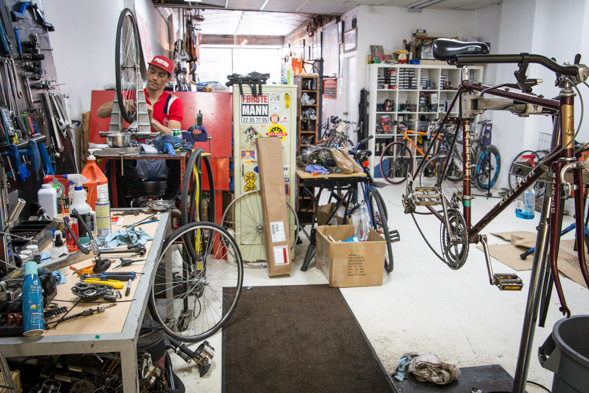 A tune up here involves an exhaustive list including cleaning, tire check, pressure check, brake checks, check/clean drivetrain, adjustment of brake pads, lube cables, adjust cones, adjust bottom bracket , derailleur check/adjustment, general safety check for $65. 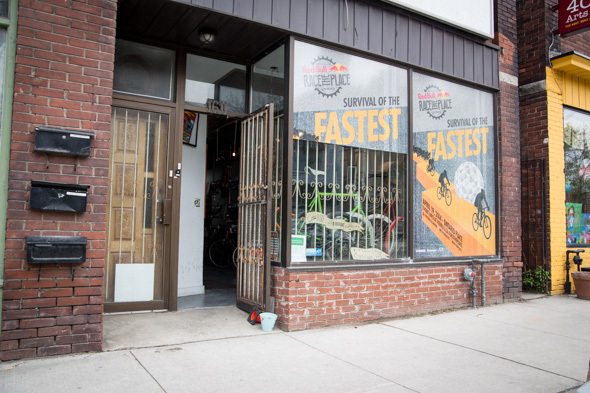 "We see about 70 percent of our customers from the local neighbourhood," says Nadir who notes that in addition to serious competitive racers and pros, they get a healthy influx of urban commuters and families coming in for a fix or special items. The shop is indeed quite a specialty store with a host of parts and accessories from brands like Schwalbe (tire levers), Frog (lights), VTech SLC (tires), a series of large capacity courier and pannier bags from a mix of international brands like Berlin's nosebleed chic Bagjack , Canadians Under the Weather and Push the Envelope , and Aussie-based skingrowsback as well as some choice jerseys of course. Among the displays, a set of sleek stained, woodgrain rimmed Velocity wheels with Michelin Lithion.2 tires caught my attention: a gorgeous oxymoron of hi-tech fat-rimmed design on what looked like teak. Racer nostalgia? "Ya, I used to race," reflects Nadir "In fact, I've always been racing in one form or another," he says as he tinkers pensively on the frame. "Keith does more racing than me, actually." Bike price range: low $800's and up (depending on custom build). Service options: full service repair; tune up for $65 per above.